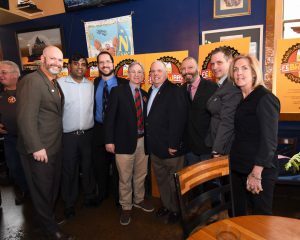 On February 1st, Governor Larry Hogan, Comptroller Peter Franchot, Director Kelby Brick, the Maryland Office of Tourism Development, and the Brewers Association of Maryland came together to celebrate the significant economic impact that craft brewing has had in Maryland. Governor Hogan presented a proclamation declaring February as “FeBREWary” in Maryland. Mark Burke and Sam Costner of Streetcar 82 Brewing Co.
Jason Bailey and Amit Rupani (along with their hearing partners) of Seawolf Brewery. This is an example of the Office’s commitment to the Deaf Ecosystem, which addresses employment and business ownership in the Deaf and hard of hearing community.